This entry was posted in Comments about Cycling on December 3, 2014 by Steve Tilford. I saw that the USAC changed their line in the sand qualification process for the Elite race at Cyclocross Nationals in Austin and now allows for a rider to petition to get into the event. I was a little pissed initially, but then reconsidered. I was being selfish. I have pretty much written off the cyclocross season. I knew, at best, I might, just might be able to race by January, and not a day before. And I only wanted to race the Elite race, not the Master’s, if I had to make a choice. But, since I didn’t race last season, and now not again this year, I wouldn’t have been in the top 90 of the rankings or have a UCI point, so I couldn’t compete. Now, I guess I could/can. It made me a little mad that they announce this just a little over a month ahead of the race. But, it is a good rule and I applaud that they reconsidered. Better late than never. There are other guys like me, riders that race in Europe and don’t have any UCI points, riders hurt early season and are just recovering by January, and others that have peculiar problems that need to be taken into account. The rule is good. If you want to take advantage of this exclusion, you need to apply by December 20th, after December 10th. The specifics can be found here. Down in Broken Arrow, near Tulsa, this weekend, they are holding Ruts and Guts Cyclocross races. The races are on the National Racing Calender this year, and next season, are going to be UCI races, so they are going through the stages to grow. I’ve done the race a few times and it is a blast. 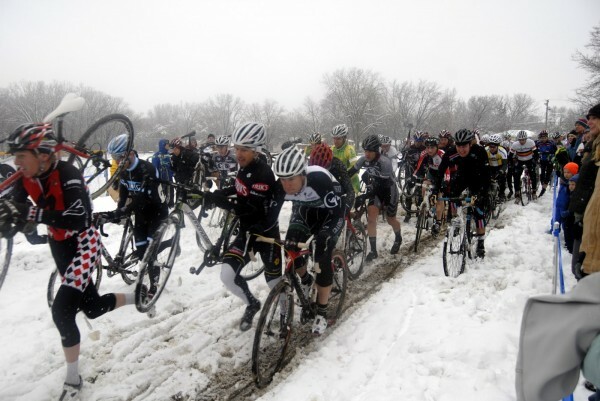 I think the racing in Tulsa will be a lot like it will be in Austin in January. There is a little Ruts and Guts logo above that is a link to the races. You can also click here for the race specifics. Tulsa is a cool place to hang out, so if you have the opportunity, you should try to get over there. I ran two miles the other day. Well, I “ran” two miles 100 meters at a time, pretty much stopping when I started limping badly. But I ‘m going to stay at it. I think the impact is good for the muscles surrounding my hip. The bone is healed now, but my muscles aren’t working well yet. It is amazing to me that it is such a slow process. Attrification of muscles starts as soon as they aren’t used. It’s pretty hard to get them back to normal. It’s not going to look like this in Tulsa, or Austin, for that matter. But, it is supposed to be pretty nice this weekend, in Tulsa, 50’s. I’ve done the race when it was in the 90’s. This is an easy one. Not enough pre registered and they want more money. One thing that really help strengthen my hip after fracturing it was walking tall grass CRP fields with my dog. Hunting. Bromont would love it and walking in that thick grass forces you to pick your knee up high and pull your foot through. Also, it works on stabilization because the ground underneath your foot is going to be uneven. Take a camera instead of a gun if shooting isn’t your thing. You might get some awesome shots. Doug Swanson! He sure can ride a bike. Pro 1-2 field has already got too many guys for a non-seeded rider to have a chance. The snow isn’t going to make passing back markers easy either. Who is racing in Europe that would not have points to be in the top 90 in the USA? Steve if you haven’t already you should try power cranks for therapy and/or training. Ask around If you can borrow a set or bike with them on it. I’d lend you mine if I was not so far away. You’re looking at 2014. You want to be looking at 2015. Only 3 people registered for the elite men’s race so far. It just opened for us yesterday.